I’m off to New York City tomorrow for a big wedding, and although time is limited, I’ve got to go to at least one exhibition while I am there. 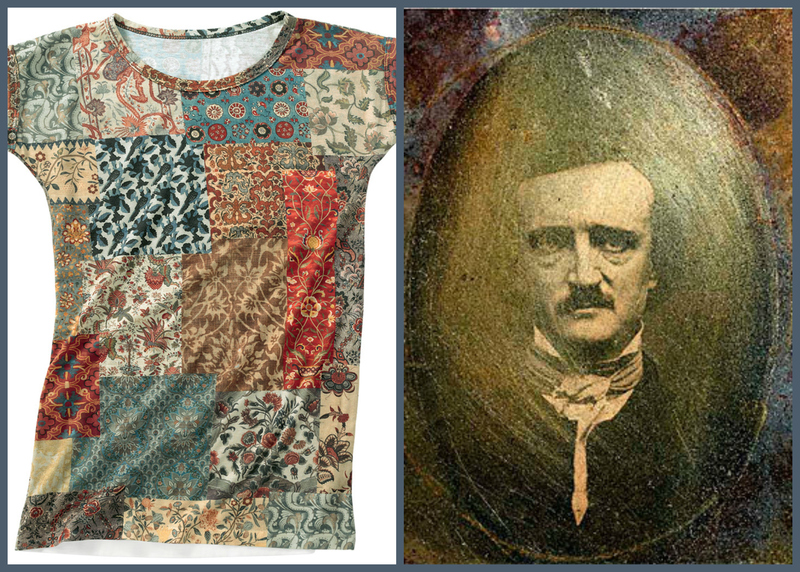 I’m torn between the Morgan Library & Museum’s Edgar Allen Poe: The Terror of the Soul and an equally new exhibition at the Metropolitan Museum of Art: Interwoven Globe: the Worldwide Textile Trade, 1500-1800. I think the latter is going to win out for two reasons: 1) the early modern period is my teaching specialization and; 2) it features textiles–materials, stuff–which is going to win out over literature any and every time. Anybody that has ever studied–or even casually glanced at–European paintings over this long period can see the increasingly liberal display of eastern textiles throughout the era, and most especially in the art of the Renaissance and Dutch Golden Age: this is material evidence of the “interwoven globe”. The value that was placed on eastern textiles, most prominently carpets, is indicated not only by their appearance but also by their placement; I use a lot of art in my classes, and inevitably my students always ask: why is that oriental rug on the table? This famous painting, Hans Holbein’s The Ambassadors (1533; National Gallery of Art) is a perfect case in point. I use it to illustrate the ideal of the Renaissance Man: these two young French ambassadors, amidst the symbols of their expertise, with an anamorphic skull lurking in the foreground to warn the viewer against excessive worldliness, create quite the composition. There’s a lot to see and discuss, but inevitably my students ask why is that oriental rug on the table? Before they notice the skull. Carpets from the Middle East appear in European works of art as far back as the thirteenth century, after the Crusades opened up this exchange, but they become a much more common decorative element several centuries later. 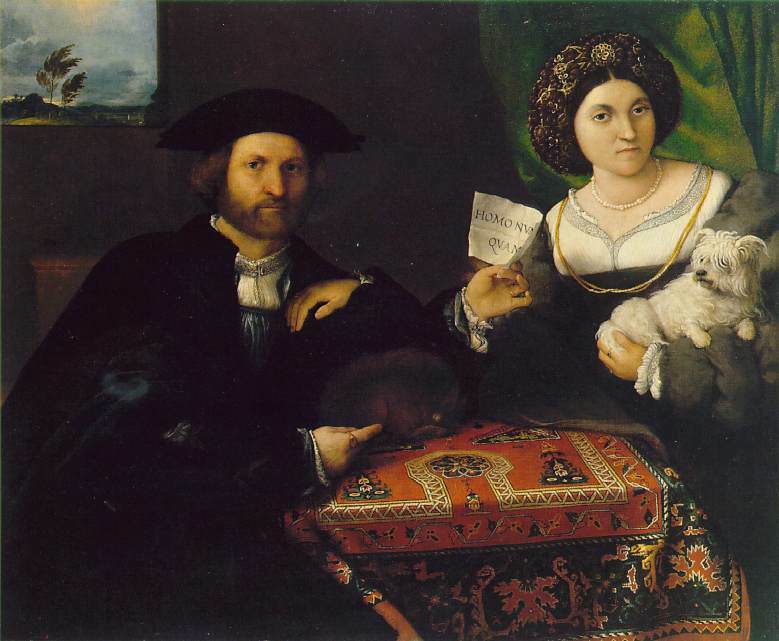 Renaissance artists like Carlo Crivelli and Lorenzo Lotto used carpets frequently in their works, so much so that they even have distinct carpet patterns named after them. The presence of the carpet in these paintings immediately conveyed an image of wealth, education and achievement to the onlooker; it was a decorative (but certainly not unsubtle) way of conveying status in this aspirational age. Jumping forward to another aspirational era, the Dutch “golden age” in the seventeenth century, and carpets seem to be on every painted table, particularly those of Johannes Vermeer and Gabriel Mëtsu. 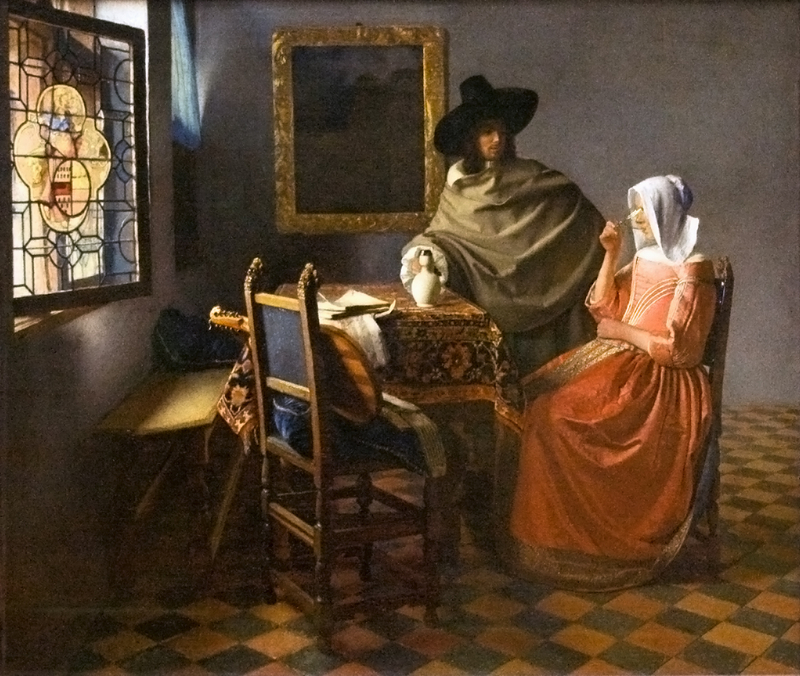 They appear so often they start to look common, rather than like possessions of the privileged; Vermeer in particular is rather egalitarian with his carpets, which appear in the close proximity of several maids and even a prostitute. Before long, they’ll end up on the floor. 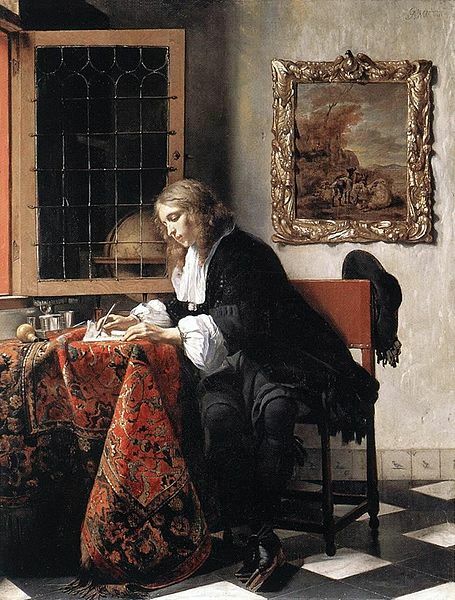 Johannes Vermeer, The Glass of Wine, 1658-1660, Staatliche Museen Preußischer Kulturbesitz, Gemäldegalerie, Berlin; Gabriel Mëtsu, Man Writing a Letter, c 1662-1665; National Gallery of Ireland. PS. In terms of exhibition souvenirs, I think I prefer the Interwoven Globe tee shirt to the Poe magnet. That clinches it. This entry was posted on Wednesday, October 9th, 2013 at 6:23 am	and tagged with 17th century, Art, books, Decorative Arts, Exhibitions, Literature, museums, Renaissance, Shopping, Textiles and posted in Culture, Current Events. You can follow any responses to this entry through the RSS 2.0 feed. When your student asks “Why is the carpet on the table?” tell him that some rugs are too good for the floor! Well in this era I think that all rugs were too good (expensive) for the floor! I’ve always wondered if the tables were planks of no particular luster and that the carpets were better looking and washable..And maybe they protected the wood? Or did they move them from table to table? 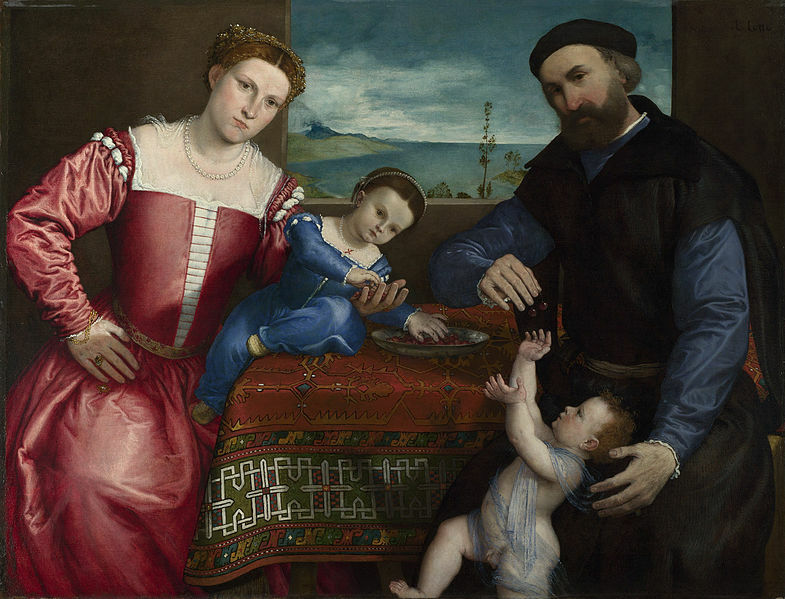 As a docent in an (originally) unheated building I often suggest to my visitors that they look at all the clothing people are wearing in the portraits – it was cold when we only had fireplaces! 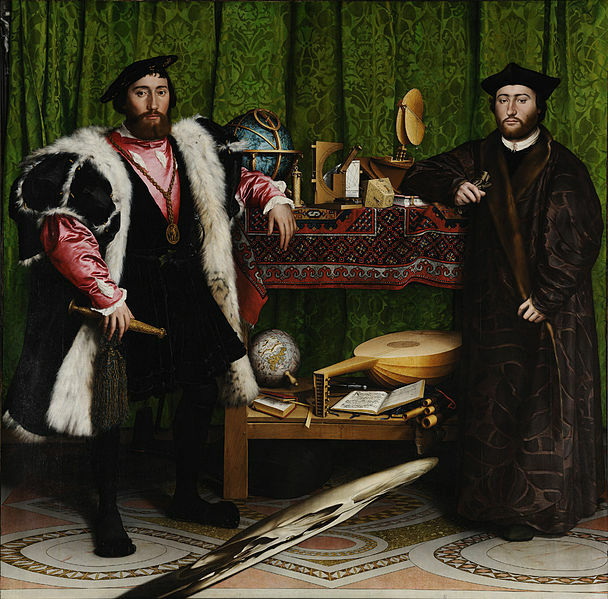 Your first image, Hans Holbein’s ‘The Ambassadors’ illustrates that really well. The artists certainly moved them from table to table, Jane; but I’m not sure what the practice was in the average (wealthy) household. If you could afford to have a table carpet centuries ago, you could afford to have a beautiful table, and a table in a best or formal room was considered to be “unfinished” or “undressed” if it DIDN’T have a covering of some sort on it. It was the custom three or more centuries to cover table carpets with a folded over linen table cloth during meals, to protect it from spills. For impromptu meals, the carpet was often just pushed to one side (food and drink were taken on bare wood) thus exposing the wooden table beneath it. In Dutch paintings, we often see this “pushed to the side” carpet depicted, and the tables seen beneath them are carved, with large bulbous legs, etc. Do a Google search for “Dutch painting Cornelis de Mann” to see images of these tables. As an aside only the very rich put their carpets on floors, and this persisted even into the 18th century. Many large manor houses in England, for example, had bare wooden floors in the best rooms. Oops, typo. His name is Cornelis de Man, and a very nice painting by him showing a handsome table with carpet off to the side is called “The Chess Players”. Love the cat on the hearth! great blog …look at past ones…. One of my ancestors had a “turkey work carpet” for his table. How do I know this? In Essex County in 1675 John Cogswell of Ipswich pursued a lawsuit about his father’s estate, including a carpet that had survived the shipwreck of the Angel Gabriel when brought from England to New England. In the papers a servant Samuel Haines deposed ” I do remember that my master had a Turkey worked carpet in Old England, which he commonly used to lay upon his parlour table, and this carpet was put abard among my master’s goods, and came safe ashore, to the best of my remembrance: all which goods, together with some provisions which were saved then, good-man Gallup brought to Ipswich in his bark for my master” I suppose “turkey work” meant a Turkish or oriental carpet. What a great contribution, Heather, thanks so much for sharing it! I know from my own research that “Turkey” was a general term for the Middle East/eastern Mediterranean. Great reference, great source.